Online Italian classes designed for your individual needs. 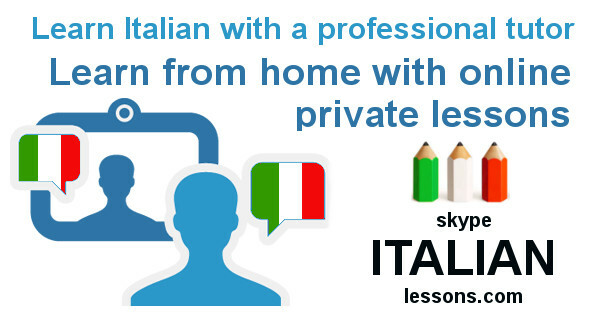 The most effective way to learn or improve your skills in Italian is to practice with a native experienced teacher. I can provide one-on-one Italian language lessons and practice that will quickly and vastly improve your Italian language abilities. My Italian classes via Skype include many personalized activities via numerous activities and exercises. General Italian classes cover a large number of topics. Each student chooses the focus of his or her classes based on their specific needs and desires. You don’t need to worry about commuting to your traditional Italian school after work anymore, traffic jams, finding parking space, arriving home late… With Skype Italian Lessons you can stay at home get comfortable in your favorite sofa if you feel like it, and let modern technology transport you to your classroom with your native Italian teacher who is in Italy! Each lesson lasts 50 minutes. You can choose different kinds of lessons. General Italian, Business or Exam Preparation. Before each lesson I provide learning materials ( pdf files, links etc.) to use during the lesson or after. Learn Italian fast and easy! Start your course today! How to start my online Italian classes? It is a free ( no hidden costs, no obligation) 30 minutes trial. Fill the form proposing when you are available to have a lesson. I will reply proposing a day / time for your free trial lesson. 2 Install Skype. It’s free and really safe to download (It is a Microsoft product). Before the lesson you have to accept my contact request on skype.